Less Than with Octavarius - January 2013. There are two improv groups at Albright College, a small liberal arts college in Reading, PA, that make up Albright Improv. Less Than or Equal To is our open-access group, while Soviet Purgatory is our audition based group. The “Ordinary Dayz” (‘13) performance featured Less Than’s first venture into long form improvisation, leading to the creation of Soviet Purgatory, Albright's long form improv group. Since its inception, Soviet Purgatory has performed at the SteelStacks Improv Comedy Festival, the College Improv Tournament, Figment Theatre in Philly, Albright Arts Night at the T.E.A. Factory, and of course, at the Albright Improv Festival. 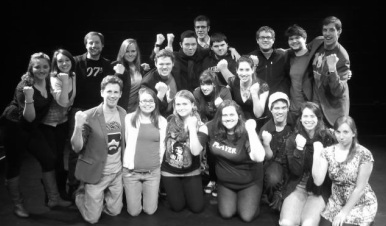 Albright Improv staged the first Albright Improv Festival in 2013. The annual festival features some of the region's best college improv teams, as well as some of the nation's best professional improv groups, including Ferrari McSpeedy, Pudding-Thank-You, and The Amie & Kristen Show. We've also hosted other professional groups on campus, including Octavarius, Joan McNeil, The Future, Notorious EKG, Quick & Dirty, and Matt Holmes.